Where the world comes to learn! 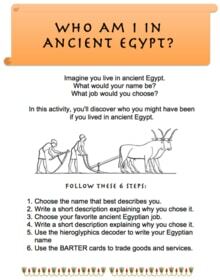 Mummies, pyramids, homework help, Cleopatra, King Tut, tombs, amulets, maps, gods, Narmer, worksheets, maps, coloring pages and more. 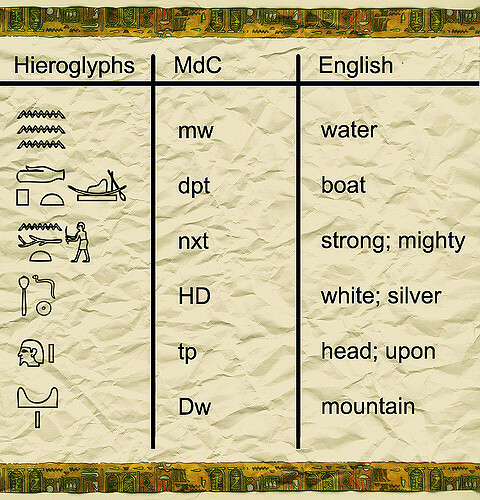 Hieroglyphics words were written and arranged much differently than we write today. We always write words the same way, with each letter in its proper place. For the Egyptians, this was not required. Hieroglyphics could be stacked on top of each other and positioned in various ways--whatever looked best to the person writing them. Among other reasons, this made it easy to fit a word into a small space, such as on an amulet. THE BIGGEST, BEST LIST OF MUMMY FACTS ANYWHERE ONLINE. We've put together 101 interesting, cool, shocking and educational facts about Mummies. Prepare to be chilled and amazed! 1. 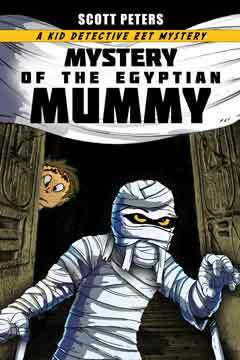 What is a Mummy? A mummy is a person or animal's body that has been preserved after death using a technique called mummification. 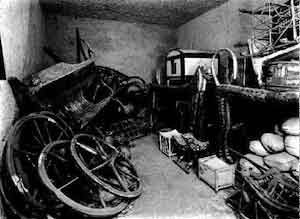 Ancient Egyptians perfected the art of mummification over centuries. They developed a method for drying and wrapping a body in linen strips that made it last for thousands of years. 2. When did Ancient Egyptians start making mummies? Egyptians started making them around 3400BC. 3. When did Egyptians get better at making mummies? In 2600BC ancient Egyptians finally figured out that if they removed the body's internal organs before wrapping a person up, their body would last instead of rot. 4. What happened next? Egyptians went a step further. They dried the bodies out completely for 40 days before wrapping! 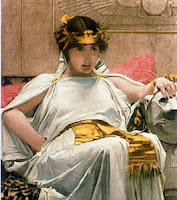 Amazing mysteries surround the timeline of Cleopatra's life and death, and some massive scandals, too. Read on to learn more! 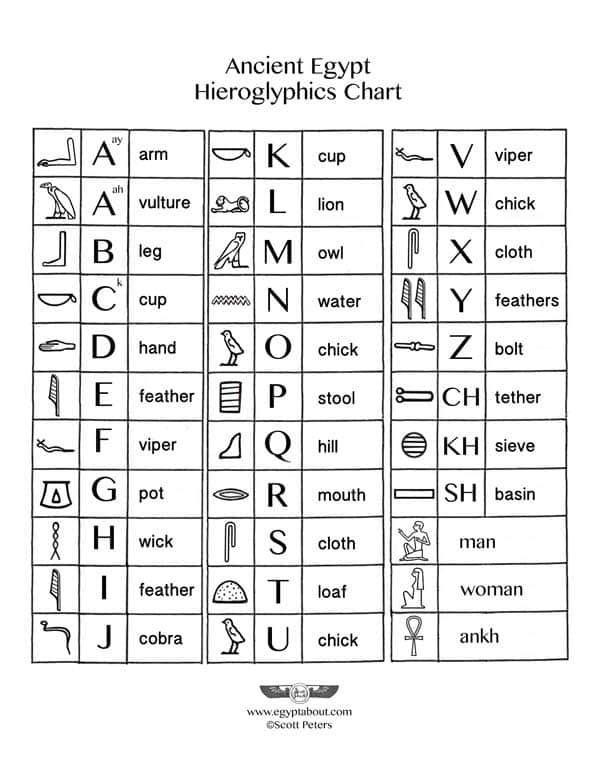 Do you need a hieroglyphics chart to help with your homework projects, for school classroom activities, to accompany a worksheet, or to decode hieroglyphics words and phrases? I've put together this handy table. It translates the English alphabet letters into their hieroglyphic equivalent. Please feel free to print, share or embed this infographic for personal or educational use. Whether you're a teacher, student, homeschool parent, or someone who enjoys exploring the world of ancient Egypt, I hope you find my hieroglyphics infographic chart useful in whatever projects or assignments you're working on! 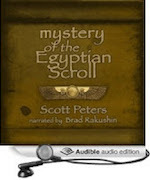 Have you ever wondered what explorers found when they opened up an Egyptian tomb? Read on and you will be amazed, puzzled, and awestruck by the objects and artifacts they uncovered. 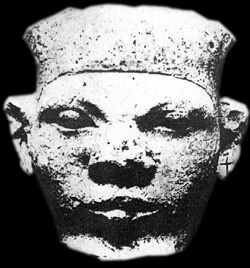 Exact details about King Narmer are sometimes vague and lost or confused in the mists of time. 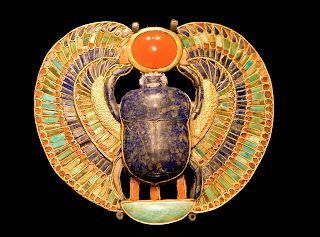 Why were scarab amulets important to ancient Egyptians? Scarab beetles symbolized eternal life and rebirth. Because of this, scarab beetles held great religious power. Why? If you could be reborn, it meant you could live for all eternity, which was a pretty good deal. In Egyptian mythology, a scarab-headed god called Kephri was responsible for rolling the sun across the sky all day, then pushing it over the edge of the horizon to its death every night. The next morning Kephri would rebirth the sun by rolling it back up into the sky from the opposite horizon. How did the scarab beetle earn such an amazing myth? Ancient Egyptians saw the 'magical' way beetles produce offspring, which you can read more about below. From this, they decided that beetles embodied the cycle of creation. We searched around and discovered 10 really old Egyptian proverbs. 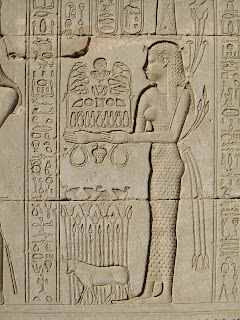 These ancient Egyptian sayings were carved on temples, stelae and tomb walls thousands of years ago. Amazingly, to us the advice still sounds pretty useful today. Read on and see if you agree. The language is a little fancy, but if you think about them a moment, they start to make sense. Give it a try. What do you think these proverbs mean? Empty not your soul to everybody and do not diminish thereby your importance. The nut doesn't reveal the tree it contains. The seed cannot sprout upwards without simultaneously sending roots into the ground. A house has the character of the person who lives in it. A pupil may show you by his own efforts how much he deserves to learn from you. Social good is what brings peace to family and society. Knowledge is not necessarily wisdom. Each truth you learn will be, for you, as new as if it had never been written. 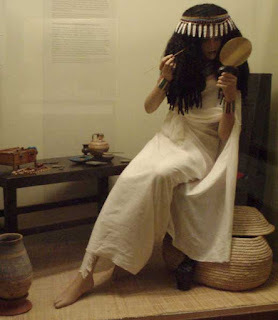 Ancient Egyptian Wigs We put together this list of 10 facts to answer your most pressing questions about these amazing historical artifacts. Whether you're a kid, teacher, homeschooler, a student looking for homework help, a hairdresser, or just a curious fact-lover, we think you'll find this information fascinating! Let's start off with the basics. 1. What were Egyptian wigs made of? The nicest wigs were made from human hair. These were also the most expensive. An accounts list from the town of Kahun put hair’s value in the same category as gold. For the middle class, particularly those who couldn’t afford wigs made completely out of human hair, they would purchase a blended wig, which was constructed of part human hair, part vegetable fibers. Wigs could also be made of sheep’s wool. The absolute cheapest wigs were made out of 100% vegetable fibers. Hi, I'm Scott Peters. I've always been fascinated by ancient Egypt. In addition to writing, I've created exhibits for the Smithsonian, the Washington Children's Museum, Universal Studios and more. Check out some of my books!